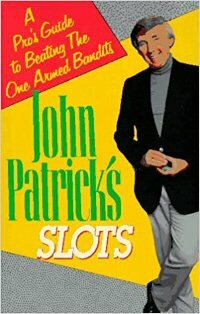 The multifarious misconceptions of self-proclaimed slot machine pro John Patrick. A lot of people claim to be professional gamblers. Many of them even have the profits to back it up. But most of them are either blackjack aficionados or poker pros. A few even possess the rare skill of dice control, giving them an edge at the craps tables. But anyone seriously claiming to be a professional slot machine player is either a liar or a cheat. Or, he may just be a salesman. That certainly seems to be the occupational path of gambling educator, casino strategist, author and television host John Patrick. Some of you may recognize him as the former host of his own national cable TV show called So You Want To Be A Gambler. Or, you may have come across one of his 20+, each proffering a tutorial to beat the casino in one game or another. The theory that slot machines run hot and cold. The validity of money management systems as strategies. Neither of these concepts can be proven. In fact, they have been debunked time and again by basic mathematics. The nature of scientific probabilities is such that no machine can deviate from its programming. A game meant to pay out 90% of its intake will, over time, pay out exactly 90% of its intake. Let’s take a deeper look at John Patrick’s hypothesis regarding slot machine strategies. Imagine for a moment that a slot machine has a brain; that it’s teeming with biologically driven emotions; that it’s capable of recognizing people and deciding who it does and does not wish to reward. If you actually imagined that happening, I’ll give you a moment to stop laughing. It truly is an absurd notion to think that a machine operating on the direction of a computer program can run hot or cold. No slot machine can suddenly decide that it’s done paying out for the day. It cannot return from that decision and choose that the time is right to award a jackpot. These situations are entirely random. Every spin of the reels has the exact same odds of delivering a win as the previous spin. Unfortunately, this is a concept, known in the realm of psychology as ‘cognitive bias‘, in which gamblers tend to believe a machine is either hot or cold based on past performance. According to John Patrick’s Slots, slot machines are quite capable of running hot and cold. He recommends players set a “naked pull” limit; a naked pull being any spin that fails to begets winnings. He suggests choosing a limit of 7 to 14 pulls. Once that number of naked pulls occur in a row, the player is told to leave and play a different machine. Note that most gamblers who proscribe to the incogitable theory of hot/cold prefer to believe that a machine is hot at this point. A game that’s gone so many spins without a payout is often erroneously conceived to be ‘due for a win‘. Both notions are scientifically, if not logically, impossible. I’m all for proper bankroll management when it comes to budgeting your household expenditures. Making a bankroll last a few hours, even a few days or weeks, is imperative for maximizing the entertainment value of any gambling experience. But as a slot machine strategy? No. Patrick advises his readers to set a stop loss limit of 60%. A player who loses 60% of their entire bankroll (i.e. $60 of $100) should call it quits. This way, the player cannot lose their entire bankroll in a single session. How a man who claims to be a slot machine pro considers this a strategy, I cannot fathom. Strategies are meant to increase a player’s odds of winning. There is no way to divvy up a bankroll to slide the scale of the casino’s edge any further in your favor. Whether you spend $100 in a slot machine over 5 minutes or 5 days is not going to change the payout percentage of that machine, nor your odds of success.